An IiAS study on executive remuneration reveals that, in the past five years, CEO salaries in the S&P BSE 500 companies has outpaced performance. This is a worrying trend across most sectors, especially the automobiles, FMCG and engineering companies. Further, in sectors like construction materials, where there is some degree of linkage between pay and performance, the median pay levels and remuneration multiples are significantly higher. To address this, compensation committees in these sectors may need to rethink the entire pay construct and devise pay arrangements which are more equitable and help align executive expectations with stakeholders’ desire for fairness, benchmarking, and comparability. While pay growth has been aligned with performance in some sectors, there is little evidence of performance linkages in the overall market. 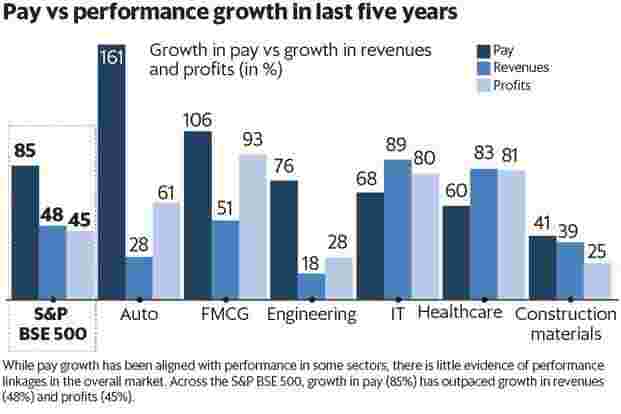 Across the S&P BSE 500, growth in pay (85%) has outpaced growth in revenues (48%) and profits (45%). 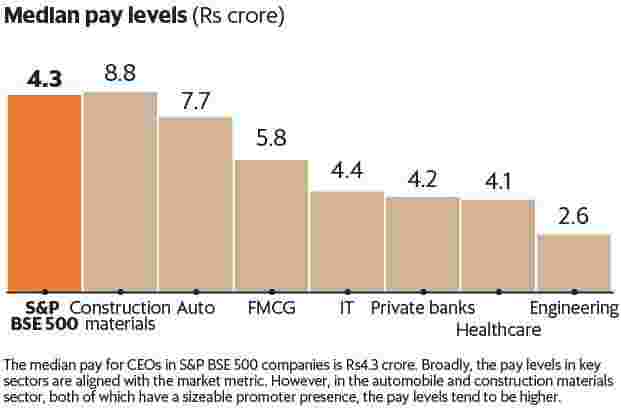 The median pay for CEOs in S&P BSE 500 companies is Rs4.3 crore. Broadly, the pay levels in key sectors are aligned with the market metric. However, in the automobile and construction materials sector, both of which have a sizeable promoter presence, the pay levels tend to be higher. 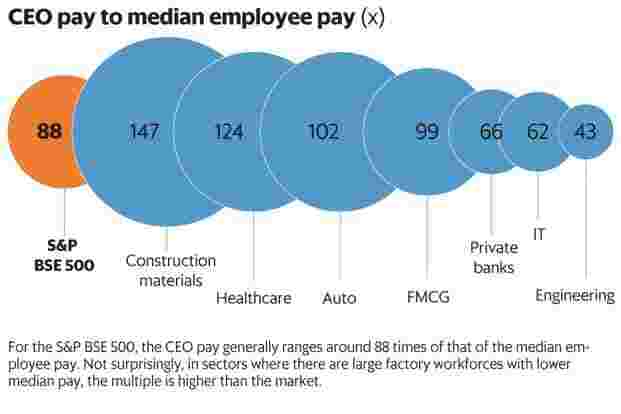 For the S&P BSE 500, the CEO pay generally ranges around 88 times of that of the median employee pay. Not surprisingly, in sectors where there are large factory workforces with lower median pay, the multiple is higher than the market. 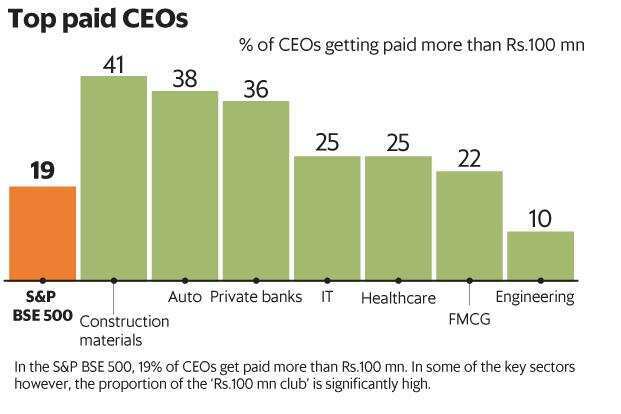 In the S&P BSE 500, 19% of CEOs get paid more than Rs100 million. In some of the key sectors, however, the proportion of the ‘Rs100 million club’ is significantly high. This is the time of the year when boards are called upon to x pay levels of its members for the coming financial year. This series on CEO pay, compiled by IiAS using data from comPAYre, IiAS’ cloud-based pay-versus-performance tool, is aimed at sensitizing boards on the remuneration trends across the market, as a basis for determining appropriate pay structures. ■ Data has been sourced from annual reports for the S&P BSE 500 companies and compiled using IiAS’ proprietary pay analytics platform, comPAYre. ■ Data pertains to CY2016 or FY2016-17 (depending on financial year-end for respective companies). ■ PSUs have been excluded from the analysis. ■ Fair value of stock options granted has been included while calculating overall pay. ■ The pay growth chart pertains only to directors who have been on the board for the past five years.